There have been times when one of your family members or your friends would go out to get some groceries and forget that one thing that you asked of them. Perhaps because it was not on the list or maybe you just shouted at them with what you wanted while they were in the car and driving away. Anyway, the situation is extremely annoying and we understand that. 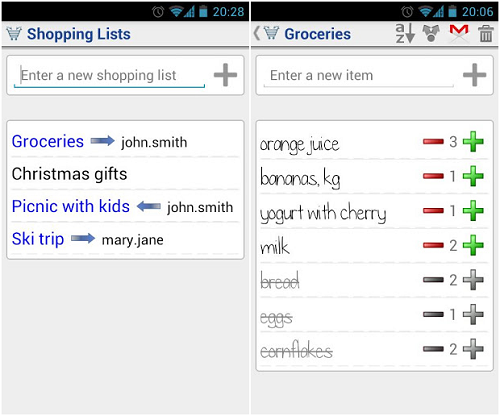 Well, someone else was really frustrated and he, who is also a member of XDA Forums, came up with this interesting shopping list application. So what is unique about this list? Find out after the jump. This application is called Shared Shopping List and we are pretty sure you understand exactly what is so unique about this application. Of course the interface is similar to many other applications that are around serving the same purpose. You can create a specific list, add a quantity to it and when you have made the purchase you just tap it and it crosses off automatically. Once you are done shopping you can delete the entire list and come with a new one. But this one also offers sharing capabilities. You will be able to share the lists with others who use the same application. All you need to do is head on to the Google Play Store and download the application. Once the app is installed you need to set up an account. You can create the list like you normally would but if you tap on it, it will give you the share option. No one will be sharing the same credentials, but instead, you will be able to add people as friends with whom you will then be able to share lists. So all you’ll need to do if you get that sudden craving for eating ice cream is to open the app, open the list, add the item onto the list, and share it with the friend or family member who went out shopping. Pure genius. This particular application is compatible with any Android phone running 1.6 or up. You can download it for free from the Google Play Store by navigating to the aforementioned link. The application is also ad-free so it’s basically quite amazing and really helpful too. The application runs perfectly fine with absolutely no bugs to report. If you have any questions or need more information, simply head on to the original thread where you should be able to get in touch with the developer.